on hibiscus nectar, tasty treat. so I can pour it out again. You quench my thirst daily; I am thankful. You give me rest from fear, doubt and worry. Green pastures, still waters are in my heart and home. most certainly Your love’s incandescence gleams through my skin. this fragrant feast bestows enough to share. Come as you are, taste, sip. This banquet is for you. 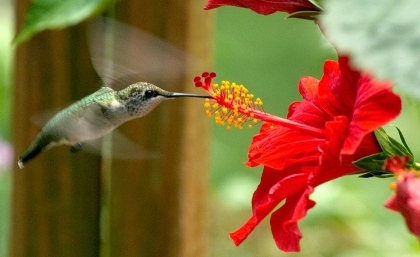 I am setting on our patio looking over the pond at red and white hibiscus as humming birds feed and a gentle breeze blows across my leggs and face. I love how you are so in tune with God and his creation. I see these things also. I love to stop and experience his presence. Thank you Susan for you precious poem you so graciously shared. Somehow, I always find God in nature, Tom. I can’t help but stop and marvel at His beauty. Thanks so much. I’m always blessed every time you stop by. Good morning! What a nice poem. I am thankful that there are poets in the world. See, something else to be grateful for! Aw, I’ll take that, Wally. Thank you so much. Bless you.